Intel is banking on the 'new' 2-in-1 convertible laptop category to arrest the slump in PC sales and turn the tide on the tablet. This year's Intel Developer Forum (IDF) is all about mobility, but it's not just the new Intel Atom Bay Trail tablets that are stealing the show – Intel also wants hybrid laptop/tablet devices to capture the public's consciousness. "Think about a world where there's really three kinds of categories in mobile computing," said Kirk Skaugen, Senior VP of Intel's Client Group. 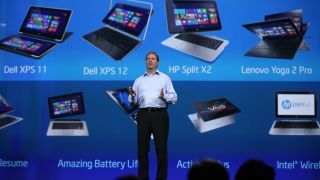 "There's the standard tablets – 7,8 and 10-inch slates – and we have our traditional notebook families. What we're doing now is saying we can create a new category that combines the best of a laptop and the best of a tablet in a single device." Now, it seems rather churlish to point out that actually 2-in-1 laptops have been around for years – I've been carrying a touchscreen, flipscreen Acer notebook to IDF for since 2010 – but finally the ecosystem is catching up with what we actually want from such devices. Like the ultra-portables, there's a minimum spec for these new 2-in-1 machines. First off they've got to have a 10-inch, or larger, screen. "Screen sizes that don't compromise the productivity of a laptop," explains Skaugen. They will also ideally have an integrated keyboard design, though that's not a deal-breaker in itself. What is though, is the operating system – it has to be a full OS. And Skaugen was quite specific about that: "Not Windows RT – to give you the full x86 compatibility that the PC industry is known to love." Unlike the ultra-portables though, 2-in-1s aren't just designed to be the elite of laptops. Sure, there will be Haswell-based, Ultrabook-like 2-in-1s, but there will also be lower-end Bay Trail-powered options. "These aren't just going to be premium devices," he continued "You'll see these 2-in-1 devices from $999 all the way down to $349 by the holidays." I asked Doug Fisher, VP of Intel's Software and Services group if the 2-in-1s were being set up to arrest the decline of the PC market versus tablets. "Absolutely," he answered. "Some people want a tablet and we want to address that market. But there is a desire – and I fall right into that camp - I do like to have a tablet but I really need a creation device. "I like both experiences, but I'm starting to get to the point where I want to carry one device, but at this stage I'm carrying multiple devices. So I really do look forward to having a tablet when I want it and a laptop when I need." The big trick though, especially with such a wide price range, is ensuring the lower-end doesn't poison perception of the entire category. Intel is making sure there are minimum specs devices have to hit, such as a touch responsiveness of around 200ms, responsiveness out of sleep, boot times and full, nine-hour battery life. Intel is really hoping this refreshed, if not exactly new, category can give the PC market a much-needed shot in the arm. It points to a small research sample across the US and China which found 48% of people buying a 2-in-1 device would have bought a 10-inch tablet if they weren't around. It's a small sample, and tablet buyers aren't going away, but so long as they're quality, desirable products, 2-in-1s could wrestle some market share back.